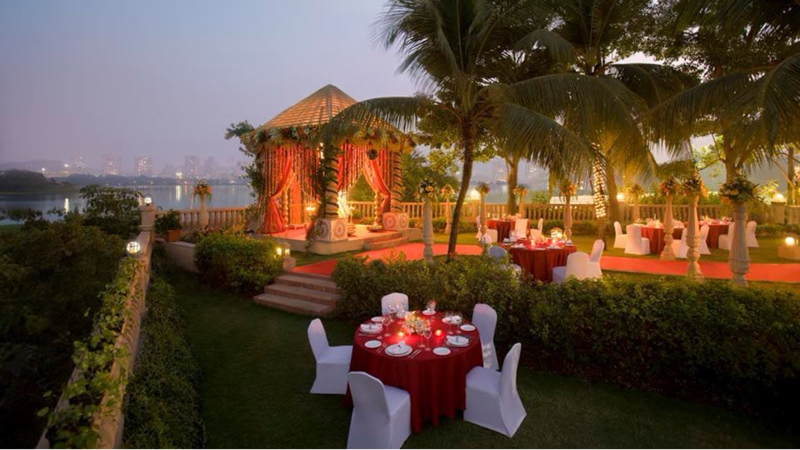 Whether you are planning to have an intimate wedding or an exorbitant one, Renaissance Mumbai Convention Centre Hotel will surely match your unique choice, budget, and requirements. With a capacity of accommodating up to 150 in seating and 2000 in floating, the venue has a cosy and comfortable interior for the guests. It also offers an in-house team of caterers that puts all the efforts to delight the guests with mouth watering multi-cuisine dishes. Nestled along the banks of serene Powai Lake, the Renaissance Mumbai Convention Centre Hotel is a luxury hotel, featuring winding walkways through 15 acres of lush greenery, beautifully designed rooms and suites, the best culinary offerings and 2.3 lakh sq. ft. of indoor and outdoor banquet space. Choose from between the breathtaking Grand Ballroom, with its soaring ceiling and posh décor, and the gorgeous outdoor areas — the verdant Renaissance Garden or the terrace overlooking the lake. You can even have a beautiful wedding ceremony right on the banks of the lake! Décor provided by in-house panel. Panel includes National Decor, Dreamz Kraft. Venue does not allow outside decorators. Catering provided by in-house panel. Venue does not allow outside caterers. Venue is available in the following time slots: 09:00 a.m. - 06:00 p.m. (Morning) 07:00 p.m. - 12.00 a.m. (Evening) The nearest railway station is Kanjur Marg Station. Additional details on the venue available on request. Nestled along the banks of serene Powai Lake, the Renaissance Mumbai Convention Centre Hotel, Mumbai is a luxury hotel, featuring winding walkways through 15 acres of lush greenery, beautifully designed rooms and suites, the best culinary offerings and 2.3 lakh sq. ft. of indoor and outdoor banquet space. Choose between the breathtaking Grand Ballroom, with its soaring ceiling and posh decor, and the gorgeous outdoor areas — the verdant Renaissance Garden or the terrace overlooking the lake. You can even have a beautiful wedding ceremony right on the banks of the lake! no matter what your requirement, the Renaissance Mumbai Convention Centre Hotel is sure to make it memorable.